As we release our newest Betton home sales report, I can't help but think these NE Tallahassee neighborhoods might be the "housing market recovery leaders" for all subdivisions in town. Demand has recovered completely, home sales are at higher levels than were recorded during the boom of the housing market, and home values are on the rise. Currently, the rate of home sales in the Betton neighborhoods is about 4 per month, which exceeds all sales levels on record going back 10 years. This increased number of home sales is likely due to the fallen home values and low interest rates, with buyers taking advantage of a limited time opportunity. 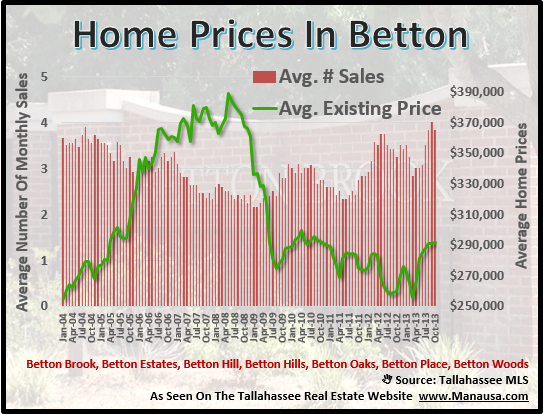 The strong results from Betton are not a complete surprise, as we have noted in previous reports that the Betton neighborhoods were leading the way in the Tallahassee real estate market recovery. The average sales price of a Betton home over the past year has been $290,000. Considering buyers were spending $110,000 more for the same houses just 6 years ago is reason enough to justify the increased interest by homebuyers. 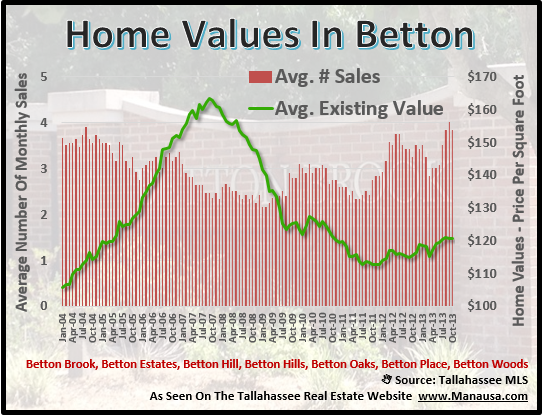 Home values in the Betton neighborhoods stabilized well in advance of the rest of the Tallahassee real estate market. Distressed home sales are all but gone, and real estate appreciation (albeit slow) has been the norm since the first quarter of 2011. So long as distressed home sales have completed, I think we'll see a continuous recovery of home values in all 7 Betton neighborhoods. The following map shows all of the homes for sale in the Betton neighborhoods. Simply hover over a marker and a picture of the home will appear, as well as limited information on the home. If you want to know more about the home, simply click on the picture and the entire detail page will be revealed. I hope you were able to learn something from this Betton Neighborhoods Home Sales Report, please drop me a note if you have any other questions or concerns that I can help you with.